come naturally to me right? Not true. Even I get stuck from time to time and sometimes I don’t know how or where to start. There have been plenty of times when I get stuck on an idea or concept and can’t think my way through it. As I am staring down a deadline I have to come up with something and quick. Unfortunately, I can’t just sit around and wait for inspiration to strike but I’ve come up with a few ways to help design that logo. Now I realize you are coming to me to design it for you so I don’t need to go into every nitty gritty detail in the design process but here are some tips to help a graphic designer out when designing your logo. I tell people all the time that all I am is the midwife that will help you bring your logo or brand into the world. What you do with it after that is up to you because it is your logo. So here are a few things that will with the entire process of logo creation. First of all, don’t hold back. AT ALL . Jot down every idea you have no matter stupid you might think it might be. Take notes, draw them, write about them, sketch them, describe them. Just let everything flow out of your head. Don’t stop and don’t even try to filter seemingly unrelated thoughts or ideas. Most importantly it doesn’t have to be fine art. The graphic designer will be trying to read your mind so even a napkin with scribbles in lips stick would be better than nothing. Start sketching and just get every idea you have on paper. content. Only worry about content. Keep in mind that a passerby only will look at it for a few seconds so it has to draw their attention. It also has to be quickly recognizable so it can be spotted in a crowd. people. Fruits? Vegetables? Etc etc... Start writing these ideas down, choose the most significant and most relatable and continue tinkering with it. What symbol or symbols would you associate the name to? What will people think of when they hear the company name? 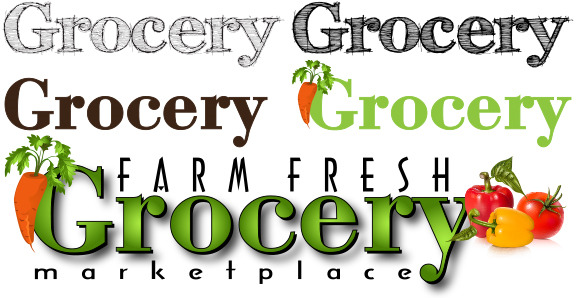 would be hard pressed to pay much attention to a “Fresh Market Logo” if it were dark brown or black. Take the color RED. It is one of the most passionate colors. It can represent action, adventure, fire. Quickly seen and strong. BLUE stands for security, trust, productivity and calmness of mind. Think of the the insurance company that wants you to feel you are in good hands. ORANGE is a color that suggests value and for centuries, PURPLE symbolized nobility and wealth. Its attachment to luxury can also be traced back to the fact purple dye was very costly to manufacture back then. It allegedly took over ten thousand mollusks to make one gram. the place where you can renew yourself. Green is the color of choice for companies associated with health and wellness, and eco-friendly products. Hmmmm, sounds like green is the way to go. Take a look around and see what the “other” guys are up to. Look at your competition’s logo and think about other relevant companies logos. You’re not planning to steal their ideas but you get an idea of what they are up to and what works and what doesn’t. Just take a look around. There are great books and sites with all sorts of logos and ideas out there. All of these things go into your sketches. Now I know what you are thinking… I don’t have the software to properly design the logo. You don’t need to have the knowledge in design programs and software at all. That’s what I’m for. All you need for any design is an idea with a solid foundation. Without it, you’ll run in circles with no clear focus on what you are looking for in a logo. Do your homework and bring your graphic designer the ingredients for your logo. Leave the cooking to the designer and give them what you have. Let them cook a bit and see what happens. The hardest part is the initial step but once the initial design is done then it is a matter of fine tuning. Add a little salt, add a little pepper but the graphic designer will cook things up for you to your liking. I always tell people that “If you really want your pizza with pepperoni I will add it for you. All I can do is to warn you that you might get heartburn.” At the end of the day it is your logo, yours to succeed or yours to fail so communication is key. That communication comes from your homework of predevelopment will help your designer to create the logo of your dreams. Good luck! Sign Studio (818) 843-9200 or send us an e-mail at info@signstudiola.com. From Concept to Finish The Sign Studio is here for you – On time and on budget! craftsmanship create custom business signs, corporate signs, ADA signs, wall signs and just about any signage product for a variety of businesses. From custom logos to architectural and environmental graphics, The Sign Studio manufactures interior signs and exterior signs for a variety of industries. want to buy the wrong business sign and end up making a costly mistake? cost of getting office signage that you do not want and forced to settle for something “standard” for your business signs? options with the same custom image for your business and corporate signage. After all, the object of all our team here at The Sign Studio is to create metal and acrylic fabricated signage to enhance our clients’ businesses image in the most effective way by supplying them with custom business signage they can be extremely proud of. if you want to order a business sign out of aluminum, or a business sign of stainless steel, or a brass metal sign, or a bronze metal sign, or a corporate sign made from electroplated metals, or a copper metal sign, or a painted acrylic office sign, or a PVC business sign , or even vinyl signage? Once you contact The Sign Studio for corporate signage, you will be contacted shortly by a sign designer who is trained to talk with customers and offer them the very best of business signs to go in their offices. Your custom office sign designer can talk to you about what exact custom image you want to display in your business signs. using some options that best fits your company’s corporate signage needs. After you receive your business sign quote, you and our design staff can again discuss the options for metal signs or acrylic signs to make sure that you are getting exactly what you want for your custom office signage. 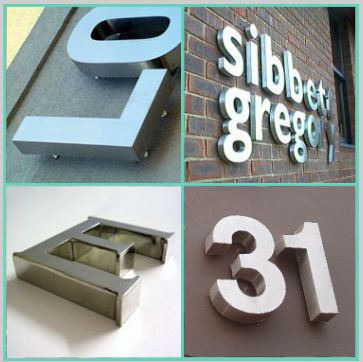 What methods of manufacturing do we use to fabricate our various types of signage? modern technology and hand craftsmanship to create custom corporate signage, office signage, ADA signs, Donor Wall signage, Memorial Walls and Honor Wall signs, plus architectural signs for interior signage and exterior signage for every industry. signs and acrylic office signs and corporate signage such as computerized routers, lasers, water jet and plotters, it is still the creativity and finest craftsmanship from our dedicated Sign Studio team that provides the highest quality office and business signage available. Every person at The Sign Studio - from the designers and sales team to the office staff and shop personal is committed to producing the highest quality business signs and office signage possible for our customers’ unmistakable custom signs without the custom cost. What materials do we use to manufacture our custom business signs? corporate sign budget, we are confident that you will receive the highest quality metal and acrylic signage product possible. anodized for a long-lasting exterior sign impervious to the elements. 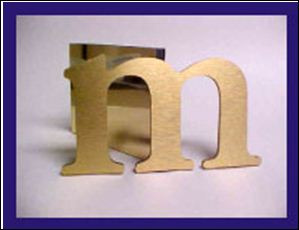 All of our metal letter/logo signs are guaranteed for life. large corporations able to afford a beautiful metal sign for their company’s image. various backers for our "Faux Metal" look business signs. This are used to give the look and feel of metal signage without the cost or weight. You can choose from a nearly endless array of custom finished thin metal laminate which we glue to backers for thickness. The backers we use for our “Faux Metal” custom metal signs are: 1.ACRYLIC BACKERS which are laminated to the real metal face and can be painted with metallic paints to match the custom lettering/logo face’s real metal face to make our metal signs. OR, to make our metal signs, the acrylic can be left black which helps add a look of depth to the custom metal signage. The depths of the acrylics generally range from 1/8" to 1". we generally leave it black which again, adds depth to the look especially on a white or very light wall. the use of solid PVC or ACRYLIC. glossy face to your acrylic office logo. Fabricated metal signs and logos offer businesses an opportunity to brand within a budget. In today’s financially viable climate, it’s important to have a professional, outstanding logo and sign to represent your business. It’s just as important to stay within budget. 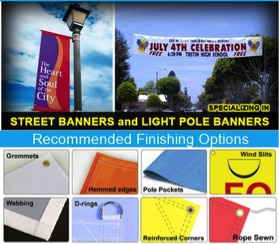 The Sign Studio has been assisting small and large companies throughout California for many years. The Sign Studio has been designing and manufacturing different custom high quality signage within budgetary constraints to accommodate all of their Customer's needs. 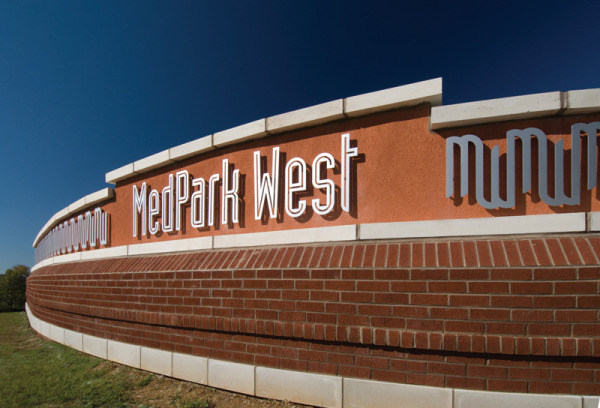 Because we only use the best materials during the manufacturing process, we deliver quality metal signage with a Lifetime Guarantee while they are on your building - interior and exterior. 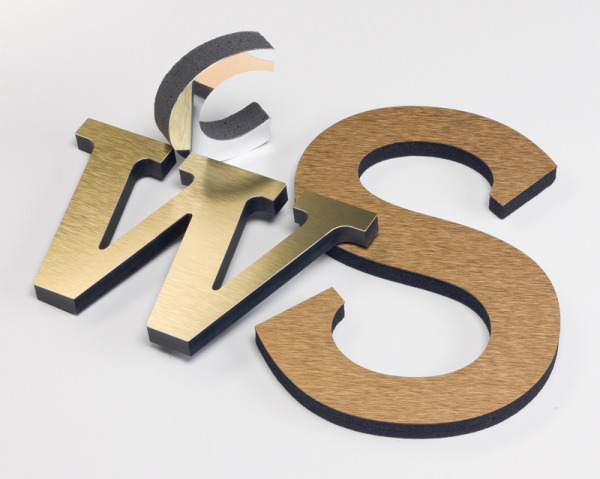 The Sign Studio uses a variety of different materials to fabricate all of the metal letters and signs. We largely use solid metals like aluminum, bronze, copper and stainless. satin or antique brass and chrome, this gives our clients a high-end, solid metal look. onto acrylic or PVC plastic. This offers the beauty of real metal at a fraction of the weight and costs. logo or lettering with metal overlay sheeting on top. Acrylic with Metal Overlay – Another option for metal signs is acrylic with metal overlay. Metal adheres to the face and presents the solid metal look without the solid metal cost. available. 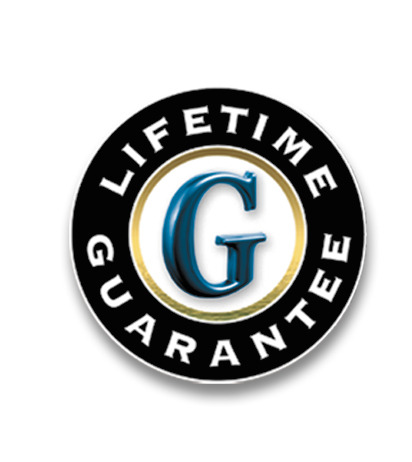 All of our aluminum and metal signs have a clear coating to ensure a Lifetime Guarantee. Where will the sign hang? Interior signagewill need a different finish than exterior signage. The lighting and space will also affect the design. have any pictures of sketches of other signs you liked or are thinking of? From color Pantones to fonts to logos, The Sign Studio can use any insight or ideas and make it perfect for your business from concept to finish. the perfect size for your business and your budget. You can also download our Visibility & Color Chart to review. Need custom signs? ADA or Electrical - We do it all! The Sign Studio is located in Burbank, and services Los Angeles and Orange County area locations that include Glendale, Studio City, West Hollywood, Century City, Los Angeles, and more (see complete list below!) Businesses depend on us for custom signs and we are here to help you find solutions.